xkcd points out that the cost of saving money on gas in the time it takes to drive out of your way will rarely be worthwhile. 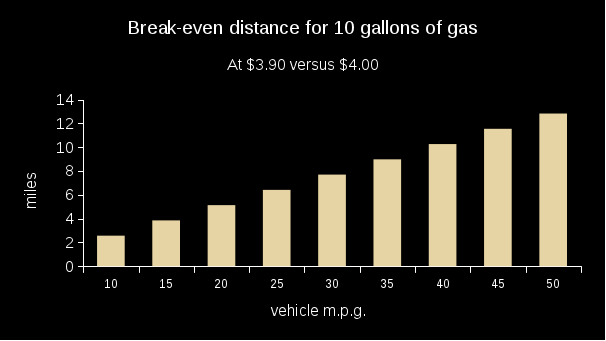 The alt text goes further to state that if you drive an average car more than a mile out of the way for each penny per gallon saved you are spending more on gas than you are saving. I was intrigued so I did a little number crunching. Suppose I can get gas for $4.00 per gallon without going out of my way, and that I usually get 10 gallons of gas. Results will fluctuate depending on the base price and the amount of gas purchased. Here is a chart showing the farthest I can drive before I start to lose money. Max distance to travel before losing money. Each line represents a different average miles per gallon from 10 m.p.g. to 50 m.p.g. I also noticed that (at 10 gallons of gas and with $4.00 base) the alt text is correct for vehicles that get up to 40 mpg. 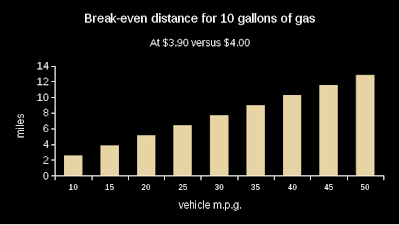 At 40 mpg the break-even point is almost exactly 1 mile of travel for each penny per gallon saved. 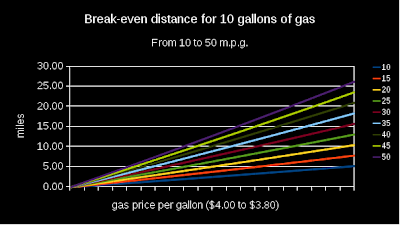 For my car, which gets about 20 to 25 mpg, the break-even point is about 1/2 mile for every penny saved.